Registration and bib pickup begin at 8:00am on race day. Race day registration is $30. The course is an up-and-down paved path through the neighborhoods of Avon. The course starts and ends on Lovely Street at St. Matthew Lutheran Church. After a fast, flat start on Lovely Street, participants will tackle their first rolling hill, making their way up Blueberry Lane and Brookridge Drive. A quick descent down Cold Spring is followed by a slow incline up to Stagecoach Road. Most of the last mile is a gradual downhill, making for a very fast finish. 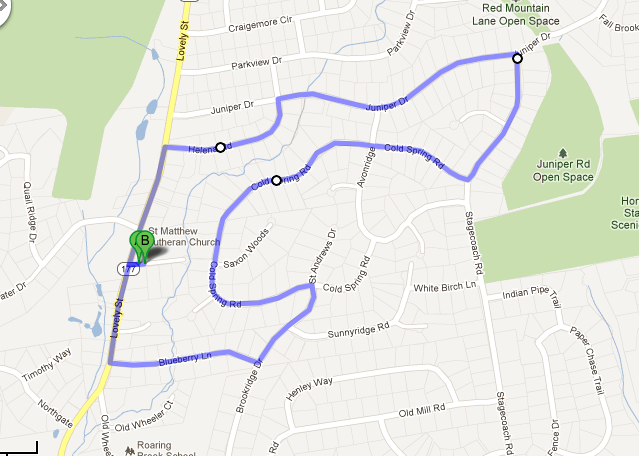 The course is hilly and is a little longer than 5k at 3.2 miles, so don't expect a PR. Water stations will be provided along the route, for people and puppies alike. In its 8th year, the Rolling Hills 5K Run/Walk is a family and pet friendly event. All are invited, both two-legged and four! Registration begins at 8:00 a.m. and the 5K starts at 9:00 a.m., rain or shine. Even if you’re not a runner, the Rolling Hills 5k+ is a wonderful opportunity for you, your family, and your pet to meet new people in the community. For more information, contact Pastor Brian Rajcok at pastorbrian@stmatthewavon.org. The Rolling Hills 5K is a fundraiser for the St. Matthew Lutheran Church Youth Group, which is committed to making a difference in our community and our world. Previous fundraisers allowed the Youth Group to complete a mission trip to Romania, provide school supplies to kids in Chicago, and help clean up neighborhoods in Detroit. St. Matthew youth have participated in Habitat for Humanity and rake leaves to help out members of the congregation. The first 100 registrants, and anyone who registers before June 15, will receive a moisture-wicking "technical" T-shirt. Awards will be provided to the top three finishers overall (male & female) and the first pet to finish. Out of town on July 13? Still want to make a donation to the St. Matthew Youth Group? Sign up as a Virtual Runner and run, walk, or not (!) wherever you are. Virtual runners will not receive T-shirts or medals. 2018 Race photos: click here. We are currently signing up sponsors for the 2019 race. If your business would like to sponsor the race, please email us at pastorbrian@stmatthewavon.org. I know that running/walking is a potentially hazardous activity. I should not enter and run/walk unless I am medically able and properly trained. I agree to abide by any decision of a race official relative to my ability to safely complete the run/walk. I hereby certify that I am in good health and I have trained to run/walk the distance of the race which I am entering. I assume all risks associated with running/walking in the event including, but not limited to: falls, contact with other participants, the effects of weather, including high heat and/or humidity, traffic and the conditions of the road, all risks being known and appreciated by me. Having read this waiver and knowing these facts, I hereby waive and release St. Matthew Lutheran Church, its officers, clergy, employees and volunteers, all sponsors, their representatives and successors, from all claims or liabilities of any kind arising out of my participation in this event, even though that liability may arise out of negligence or carelessness on the part of the persons named in this waiver. I grant permission to all the foregoing to use any photographs, motion pictures, recording, or other record of this event for any legitimate purpose. I grant permission to the foregoing to contact me by email regarding this race and future events.